Once I get the family fed, packed up for the day, and out of the house, it's time for me to find something for breakfast! I will be honest; I get up at 4 am since our family has different "launch times"....one leaves at 7:15...one at 8:30 and one closer to 9. By the time I do a bit of work on the blog and my freelance assignments, make an assortment of breakfasts, pack lunches, and get everyone up and moving at their "staggered starts"...I hit 9 a.m. and have already put in a 5 hour workday before breakfast! Usually, my to-do list screams at me and I feel guilty for making myself something to eat and I will eat a cereal bar or remnants of the mornings breakfast/lunch leftovers. Some days; however, I step back and realize that a healthy breakfast can happen in just a few minutes if I take the time to put it together! This spinach, mushroom & herb breakfast scramble recipe takes, literally, less than 10 minutes....probably about 8 minutes from start to finish. I can spare 8 minutes for a "real" breakfast in lieu of a boxed, processed meal! 1 Tsp. Dried Savory Herb Blend (Like Love MI Herb Blend--garlic, rosemary, thyme & sage. Saute the veggies. In a small frying pan, heat the oil until hot--but, not smoking. I generally melt the coconut oil or add the olive oil and spread it with a pastry brush to cover the pan. Add the onions and saute for 3-4 minutes or until nearly translucent. Add the mushrooms and saute for an additional 3-4 minutes. Toss in the spinach and saute until the spinach wilts. 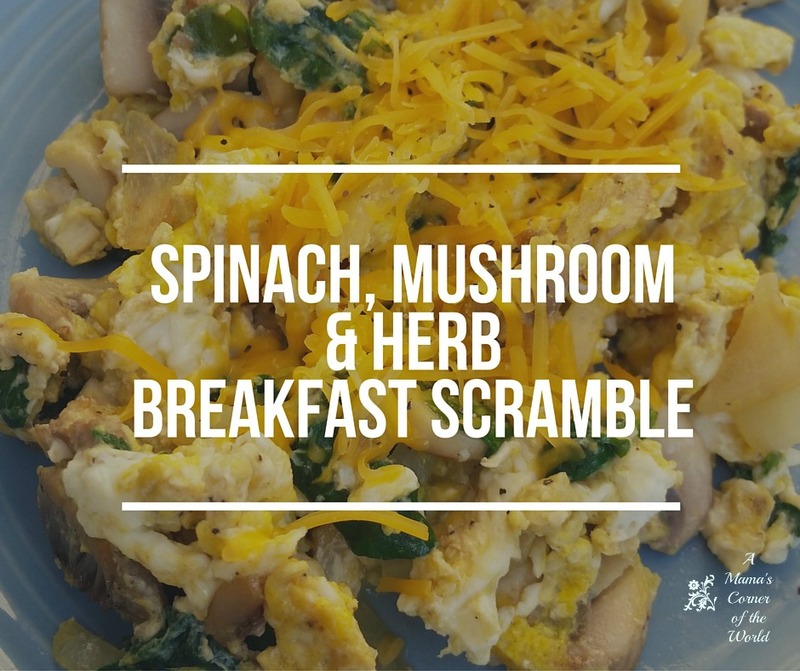 Scramble in the eggs and herbs. It's really as simple as that. Once the veggies reach your desired doneness--add in the eggs and scramble over medium-low heat until set. Season with the dried spices. Add Shredded Cheese and Serve. Remove the egg scramble to the serving dish and garnish with shredded cheese. Offer salt and pepper, if desired. Serve with toast and fresh fruit.